How do I configure my Classy integration? Create a Virtuous username & password with admin access to your Live database. This username should be reserved for the integration. Create a Classy username & password with admin access to your Classy account. This username should also be reserved for the integration. When you first log in to Classy, you see your Classy dashboard. The URL displayed at that time includes a "cid" query parameter (e.g.".../dashboard?cid=12345"). The cid value (e.g. 12345) is theClassy Organization ID that will be needed for Step 3. This is the only place to find this. This screenshot shows the Classy navigation. To the right is a box-like icon with the label "API." 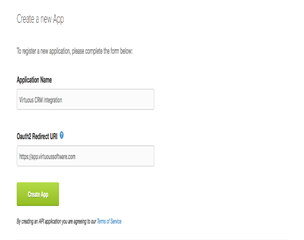 Click this to get to the API Settings page. 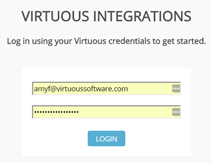 Register the Virtuous integration as a new application, filling in the fields as shown. Classy Client ID and Client Secret (Classy API key) are displayed under API Settings after registration is complete. The "Edit" button must be clicked to reveal the Client Secret. The Client ID and Client Secret are required for Step 3. Enter the Virtuous-Classy username and password you created in Step ONE. 3. 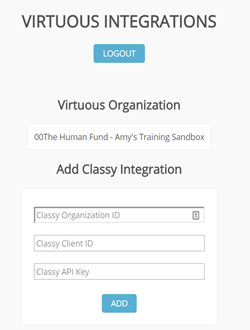 Enter your Classy Organization ID, Classy Client ID, and Classy Secret (Classy API Key), that you collected in STEP TWO above. 4. Click Add and you are done! Classy & Virtuous are officially connected and new transactions from Classy are written to Virtuous in a new daily batch, like our other payment processing integrations. For your inbound gifts to have segment codes included, set up campaigns in Classy, then copy the campaign ID from Classy (look at the URL for a 6 digit number when you are on the campaign); use that number for one of your Virtuous segment codes. Edit the program designation in Classy, to ensure that the Classy Program Designation Name = Virtuous Project Name, and the Classy External Reference ID = Virtuous Project Code. If you put your project code anywhere else, it will not get sent to Virtuous.